Do you have an idea for a business or product which absolutely needs to be brought to market? Are you willing to put some time into actually making that happen? The City of Lakewood’s Ideation Challenge is just for you. Take the Ideation Challenge by submitting a single-page Business Model Canvas and single-page Validation Plan along with preparing a 3 minute “elevator pitch” — and you could win a prize package of services valued at over $2,000 to help bring it to reality. You’ll get access that many local entrepreneurs would envy, including a 1:1 lunch meeting with successful entrepreneur and current Mayor of Lakewood, Michael Summers. – Included backup and security software, but software that may require additional license fees is not included. 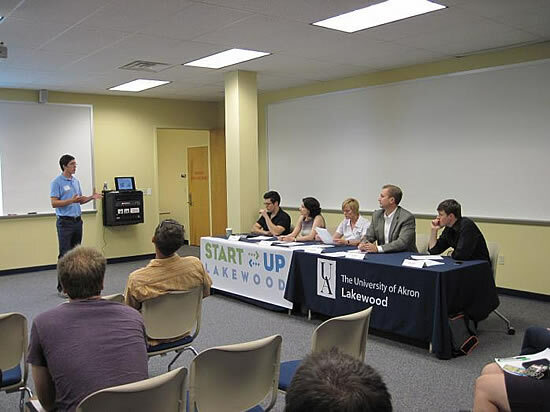 Interested candidates are invited (but not required) to attend the Startup U session on July 25th in order to ask questions about the Lakewood Ideation Challenge. Finalists present their Elevator Pitch during the August Startup U event at The Winchester (12112 Madison Avenue) – Tuesday, August 22rd. Winners are announced during the September Startup Lakewood event – September 26th. Note: All applicants should be available, if requested, to pitch live at the August 22nd Startup U event. Not sure how to create a Business Model Canvas, Validation Plan or give an Elevator Pitch? We’re here to help! You’re invited to attend the Startup U event on July 25th where the Business Model Canvas is discussed, but otherwise — time may be scheduled with Mike Belsito, Director of Ideation for Startup Lakewood, to provide one-on-one assistance until submissions are due. Mike can be contacted at info@startuplakewood.com. Business Model Canvas: A business model canvas is a single page document that outlines the key components of a new business concept. As an alternative to creating a lengthy business plan as a “first step”, the business model canvas is designed to be an important exercise that, while short in length, is critical to helping validate the business concept. The Business Model Canvas template can be downloaded here, and an explanation on how to create a Business Model Canvas can be viewed here. Validation Plan: Any new business concept is full of uncertainty and more questions than answers. Along with a Business Model Canvas, you should submit a list of at least 5 assumptions that you’re making about your new business concept – and a plan for validating those assumptions. Your assumptions and plan should be limited to no more than 1 page. We’re not looking for length – we simply want to get a sense for how you plan to test the assumptions you have about your business. Should you be invited to present in the “Elevator Pitch” Presentation Round, be prepared to discuss at least one way that you’ve already begun to test one of your assumptions! Four (4) or more individuals/teams will be selected as Finalists from those that submitted Executive Summaries to present in the Final “Elevator Pitch” Presentation Round. During the Final Round, each team will be given 3 minutes to present its new business concept followed by a 3-5 minute question and answer session between the presenting team and the judges. THESE TIME LIMITS WILL BE STRICTLY ENFORCED. The Final Presentations will take place at the August 22nd Startup Lakewood event. A laptop, projector, and screen will be provided. If you are using a PowerPoint, please bring presentation on a thumb drive / memory stick and also send it via email to Mike Belsito, Director of Ideation (info@startuplakewood.com). The applicant / team will present their business plans to a panel of expert judges made up of entrepreneurs, investors, business professionals, and consultants. Judges will select two winners – with at least one residing in Lakewood, Ohio (if possible). The Lakewood Ideation Challenge is open to all residents of Northeast Ohio, including those within Cuyahoga, Lorain, Summit, Medina, Lake, and Geauga counties. Applicants may submit as individuals or teams – which may or may not consist of existing businesses (although, existing businesses should be presenting ideas for a product or service that is not currently being offered). One winner will be selected from the City of Lakewood (so long as there are sufficient applications), and another will be selected from greater Northeast Ohio (which may also include applicants from the City of Lakewood). Applications will only be considered if received through August 14th, 2017 – and must be emailed to info@startuplakewood.com. All Applications and Elevator Pitches will be judged by City of Lakewood personnel, Startup Lakewood personnel, and area entrepreneurs and business leaders. * Cox Business technology package is worth up to $1,000.00 (eligible only to businesses in the Cox Business Cleveland serviceable area.) Cox Business technology prize package is non-assignable and non-transferable. No substitutions allowed by winners. The prize package will be applied to the monthly service fee for Cox Business core services (Telephone lines, Internet and/or TV Service). Taxes, fees, equipment and installation excluded. Other restrictions apply.